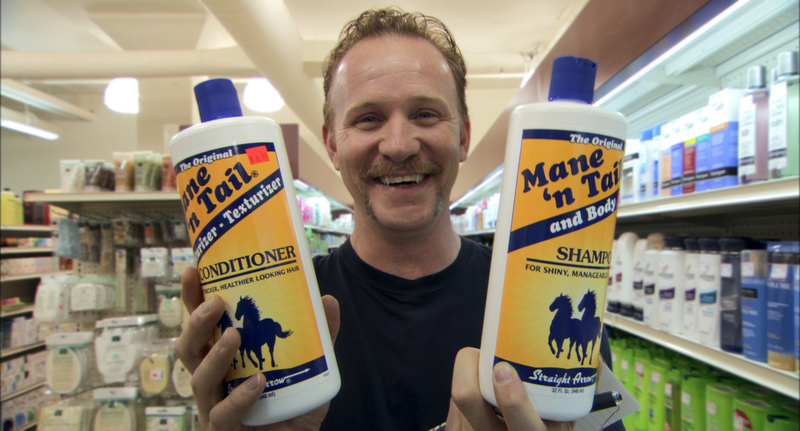 A Morgan Spurlock documentary about branding, advertising and product placement that is fully financed and made possible by brands, advertising and product placements. Typical Spurlock. Known for his outgoing and likeable personality, the documentarian takes a very secretive and layered subject matter of “selling out” and the evolution of marketing within our everyday lives. Taking this obviously sensitive matter and creating a meta-analogy through the very use of the film being a beacon for the use of advertisements and product placement, its intriguing and very clever to be able to see the spiral of the damages that this has had and will continue to have with, not just films but on billboards, on TV’s, the internet, everywhere we look. The various interviews with both directors who talk about product placements and their experiences with it along with interviews with the companies actually creating those placements is a complete juxtaposition and at times is laugh-out-loud terrible to hear these people speak with such disregard for the human conscience. The companies only talk about money, and brand awareness; even if it includes ad placement in schools, to manipulate children. The film runs a fine line of awareness, of knowing it’s revealing the dark side of marketing, without treading too deep into territory wherein the companies stop their participation in the process. Spurlock’s way of spinning a story through his “Ordinary Joe” personality and persona helps swallow this film more than anything. His calming voice, genuine surprise at the amount he can get away with as well as the thought-provoking questions he does bring up makes this film a must see for people not knowing the full of product placements, branding and marketing in general. Brand awareness, cross-promotions and the manipulation of what we see around us is a great subject matter, especially in this day and age where we cannot go 5 minutes without an advert popping up on our phones, tablets, TV screens, cinema screens, magazines or even walking down the street. And these companies go along some way to ensure their “brand” is kept intact with their visions in the film, especially the name brand “POM Wonderful”, who sponsor and present the film. During one scene where Spurlock pitches various commercials for the product to be played within the film, they disregard everything he says and instead want a commercial to bring up their competitors lack of “pomegranate” in their drinks as a way of detracting consumers away from opposing brands and into the arms of POM Wonderful. It’s incredible to have this kind of footage on tape, of their complete lack of care and ruthlessness; it’s a strong focal point of the film. Having been a big fan of Spurlock’s previous effort Super Size Me, wherein he eats a McDonald’s diet for 30 days, 3 meals a day, I knew I’d enjoy his take on this subject and the way he effortlessly creates an intriguing and engaging documentary through the use of easing editing and poignant humour throughout. It’s surprising to know he went onto direct the One Direction live show documentary. And I can only assume that it’d be as enjoyable as his previous works because of his unique voice – just don’t be expecting an Alex Gibney type of hard-hitting documentary. Included are plenty of deleted scenes fleshing out the interviews Spurlock had along with footage of his trip to Aruba to officially make it the holiday destination of the film. Also in the mix are the made commercials that are shown throughout the film for various sponsors of said film, along with a look into the making of one of these commercials and the amount of people it takes to create one; it’s one of the longest shoots from the production of the entire film, and it only lasts 30 seconds. Mind-boggling. The Greatest Movie Ever Sold is out on DVD now.